Assets under management increased to CHF 78.7 billion from CHF 72.2 billion as at 30 June 2017, driven by strong net inflows, positive investment performance and foreign exchange movements. Investment performance continued to improve, with 75% of investment management assets in funds outperforming their respective benchmark over the three-year period to 30 September 2017 (71% as at 30 June 2017). 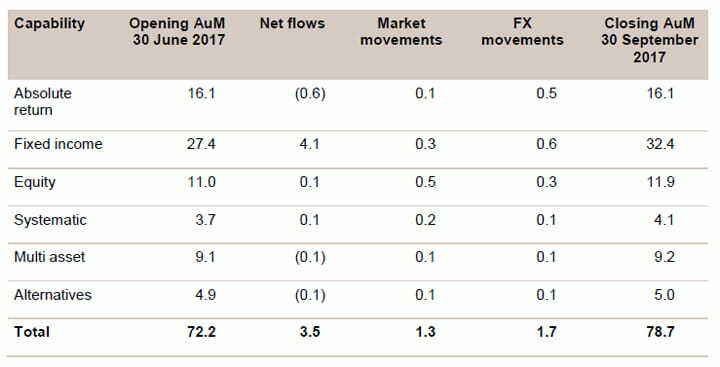 Over the five-year period, 72% of assets in funds were outperforming (72% as at 30 June 2017). Absolute return strategies had net outflows of CHF 0.6 billion as inflows into the GAM Star Global Rates and the GAM Star (Lux) – Merger Arbitrage were offset by outflows from the unconstrained/absolute return bond strategy, although this strategy has a strong pipeline. In fixed income, net inflows totalled CHF 4.1 billion. The GAM Star Credit Opportunities strategy, which predominantly invests in debt of investment grade or high quality issuers, attracted strong inflows. The GAM Local Emerging Bond fund, which invests in debt of emerging countries denominated or pegged to the respective local currency and the GAM Star MBS Total Return fund, also recorded good inflows. In equity, net inflows totalled CHF 0.1 billion, driven by inflows into the GAM Star Continental European Equity fund, partly offset by redemptions from the GAM UK Diversified, GAM Japan Equity and GAM Star China Equity funds. Systematic strategies saw net inflows of CHF 0.1 billion, driven by inflows into the GAM Systematic Alternative Risk Premia fund and related mandates. Multi asset strategies experienced net outflows of CHF 0.1 billion, reflecting redemptions in the private client advisory business. Net outflows of CHF 0.1 billion in alternatives largely reflected redemptions in the fund of hedge funds business. Assets under management in private labelling, which provides fund solutions for third parties, rose to CHF 69.7 billion from CHF 59.1 billion as at 30 June 2017, driven by net inflows of CHF 8.3 billion. The majority of inflows came from an existing client with a below average management fee margin. In September GAM hired Adrian Gosden, a highly regarded UK investor, as investment director. A new UK equity income fund will be launched later this year. GAM also continued to strengthen its distribution capabilities with the hire of Shizu Kishimoto to lead its sales and overall business operations in Japan. The Group’s multi-year change programme to deliver significant operating efficiencies is progressing well, with the new single data architecture provider selected and implementation underway. GAM has decided to absorb all research costs from January 2018, following the implementation of the new Markets in Financial Instruments Directive (MiFID II). This underlines GAM’s commitment to placing clients’ interests first, while ensuring sustainable growth for all stakeholders. GAM currently expects research costs to amount to mid-single-digit CHF millions per annum. Strong investment performance across the vast majority of GAM’s product range and the strengthening of distribution capabilities should continue to help support future net inflows. The Group’s key priorities remain delivering operating efficiencies and achieving its targets over the business cycle. The Board of Directors is making good progress on its comprehensive review of the Group’s compensation policies and structures and expects to update the market prior to the release of 2017 full-year results.